Trade evaluation can significantly impact your future trading performance — for better or worse. In the short run, with luck, you could get away without evaluating your trades. But trading blindly is not sustainable, just like gambling. The real game is to learn what works and stick to it. You know that to improve your trading results, you should keep the good trades while weeding out the bad ones. Whether you stick to your trading method or revamp it depends on how you evaluate your trades. But most traders are evaluating their trades wrongly. They don’t know what’s a good trade. After reading this article, you’ll know what is a good trade — those that you should keep taking. You’ve been advised to take only the good trades. Trading gurus will show you how important it is to stick to the good trades. But not much has been said about what makes a trade good. You cannot determine that a trade is good just by looking at its net profit. 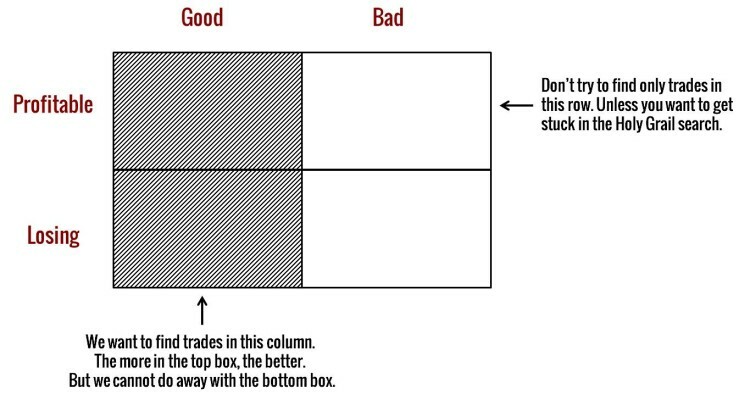 In the same vein, a bad trade isn’t just a losing trade — there’s more to it. It’s not possible to give a single comprehensive definition of a good trade. This is because there are several factors to consider. However, there are three sound principles you can rely on to decide if a trade is good or bad. 1. Good trades have a sound basis. A good trade must be based on a trading approach that produces positive expectancy. Good trades are never plucked out of thin air. You must have good reasons for taking a trade. If not, regardless of its outcome, it is not a good trade. 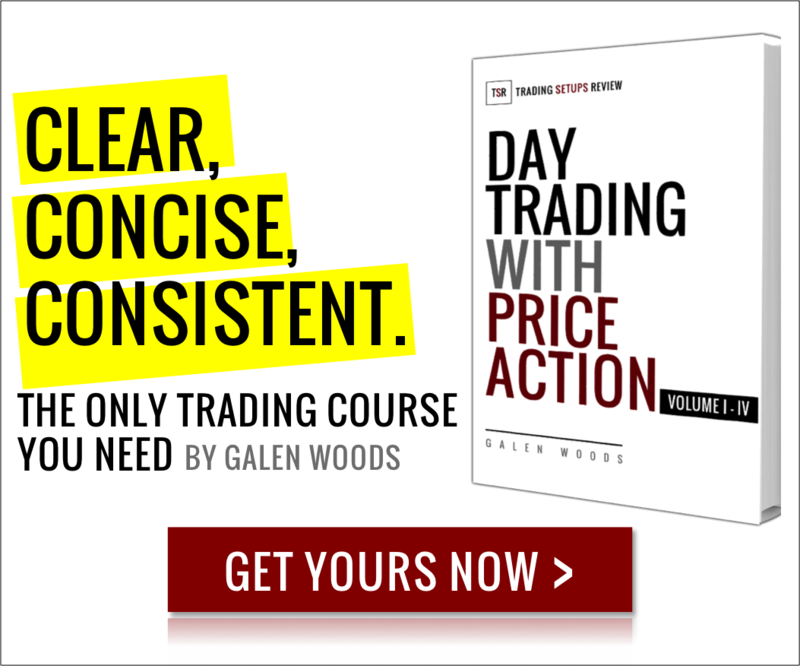 How do you know if you have a sound trading approach? It depends on the way you trade. You have a set of technical trading rules that you’ve tested rigorously. You apply those rules to find trades with historical data and in trading simulation. The total results of trades taken with those rules produce a net profit. Run a Monte Carlo simulation to confirm that you have an edge. Then, if you take trades based on that set of trading rules, you are trading with a sound approach. You have a set of risk management rules to restrict your discretion. You feel that the market is going a certain way. You take a trade based on that. The total result of the trades you took produce a net profit. Then, if you take trades based on that same trading instinct, you are trading with a sound approach. Most traders fall between the purely mechanical trader and the completely discretionary trader. It does not matter. The same principle of having a trading edge applies. Collect enough simulated trading records. Perform basic statistical analysis to figure out if you have a trading edge. There is no 100% guarantee that you have a trading edge. Decide how sure you need to be. In essence, good trades are based on a trading edge. 2. Good trades can be replicated. You must be able to replicate a good trade. Well, I do not mean a full replication. That requires a time machine. What I mean is that you must know what you are doing. You must be in control when you trade. The reason is simple: You must know what you are doing, so that you can do it again the next time. The market is trending upwards. Price is bouncing off the moving average for the second time. It is a good trade. Because you can take another trade like that when you are faced with similar price action. You can do it again and again. Over time, if the approach has positive expectancy, you will have profits to show for it. But, if you do not know why you took a trade, regardless of its outcome (profit or loss), it does not matter. Because you cannot take a similar trade again. Whether the trade is profitable or not, it is a one-off event. That’s gambling. This is why you should follow your trading plan and avoid impulsive trades. When you deviate from your trading plan, you are gambling. You can take another trade for the same reasons. 3. Good trades, as a whole, give you profits. A good trade is not always profitable. A large set of good trades is profitable. To find out if you have been taking good trades, you need to do following. Keep good records including the reasons for taking each trade and its outcome. It’s important to keep solid trading records. They will help you pinpoint both the good and the bad trades that you’ve taken. Review them to see if they are profitable as a whole. Evaluate only the trades that follow your trading plan and those that you can take again. Do not evaluate a single trade based on its result. You should evaluate individual trades based on why you took it and whether you can take it again. Instead, evaluate the results of a set of trades. The question is: how many trades do I need in the set? There is no one-size fits all answer here. However, there are two guidelines. The more volatile your trading performance, the more trades you need. The more certain you want to be, the more trades you need. If you want an oversimplified suggestion, try 30 trades. Remember that a good trade forms part of a profitable set of trades. Typical textbook examples of good trades are likely to be profitable ones. This is why most traders confuse good trades with profitable trades. And that can cause some serious problems in your trading. To banish that misconception, let’s start with an irrefutable truth of trading. Trading is a game of probabilities. This means that while it is possible to make a net profit, the win rate is never 100%. Thus, by definition, a profitable set of good trades will include losing trades. This means that some good trades are losing trades. We want to find good trades, which includes losing trades. As this line of though implies that “we want losing trades“, it’s difficult to wrap our heads around it. The diagram below will help. It shows the universe of trades. We want to take good trades which include both profitable and losing ones. Accept trading losses if you are after good trades. Don’t focus on finding only profitable trades. It’s a futile search. Let’s recall. Good trades must fulfill three criteria. Profitable trades may or may not have a sound basis. They may or may not be replicated. They are not only collectively profitable, they are 100% profitable. And that violates the irrefutable trading truth we mentioned. As you can see, profitable trades are not good at all. It’s important to note that the future of your trading performance lies with how you evaluation your trades. 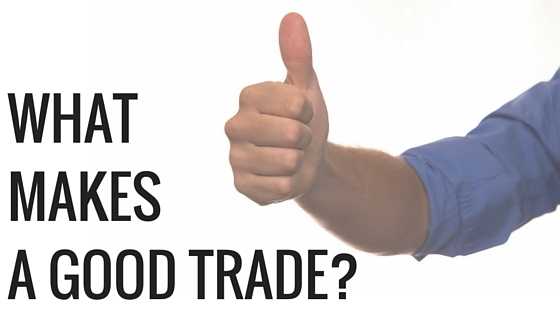 If you want to evaluate your trades correctly, it’s vital to understand what is a good trade. The setups that you target must have a sound basis if you ever want to become a consistent trader. In some ways, we are all trading in the blind. All you’ve got to base your trades on are past simulation and testing. We never know what we’ll get in the future. But the more good trades you take, the higher chance you have at trading well. If not, you will also be better poised to find out red flags in your trading method. After all, trading is an evolving craft. If you find that you’re not taking good trades (as defined above), it’s time to pause and review. And that is regardless of the profits those trades brought you. Work out a trading method with positive expectancy. Write down a trading plan and stick to it. Most of all, be consistent and patient, and slowly you’ll have enough trades to prove yourself. Taking good trades needs more effort than most people think. But it’s not impossible. And once done, it puts you on firmer ground.